So as I’m sure I’ve made clear before, I am a fountain of new ideas and new worlds. Usually, I can jot down the basics of my ideas and store them away for later, when I have time to develop them fully. Well, once in a great while that just doesn’t work. Such is the case now. I actually had the basis for this idea some time ago, and it was behaving nicely in my Google Keep, just hanging out in the list where it belongs. Except I made the mistake of choosing a muse for the main character, and from there the idea started growing at an alarming pace. And so, now I’m going to attempt to work on two series more or less concurrently. Oh and an update, I should have The Hydra Offensive back from my editor for line edits this week and then I’m just waiting for the cover art to get it rolling! If anyone is interested in doing a review to be posted on Goodreads or Amazon, let me know. If you haven’t read The Cerberus Rebellion, I’d be more than happy to send you a copy. So I’ve selected an editor for The Hydra Offensive and it’s off! Now I can focus on getting The Centaur Incursion going. I’m also looking for readers to do a launch review for Hydra. If you haven’t read The Cerberus Rebellion yet, I can send you a copy so you can get caught up, and I can send a copy of Hydra. All I ask is for a review posted to Goodreads and Amazon, and permission to use the review for advertising purposes. Hydra off to the races, and OVER 9,000! Just in time for the start of the new school semester, I’ve completed my third and final round of self-edits on The Hydra Offensive and am looking for an editor to give it a professional pass. 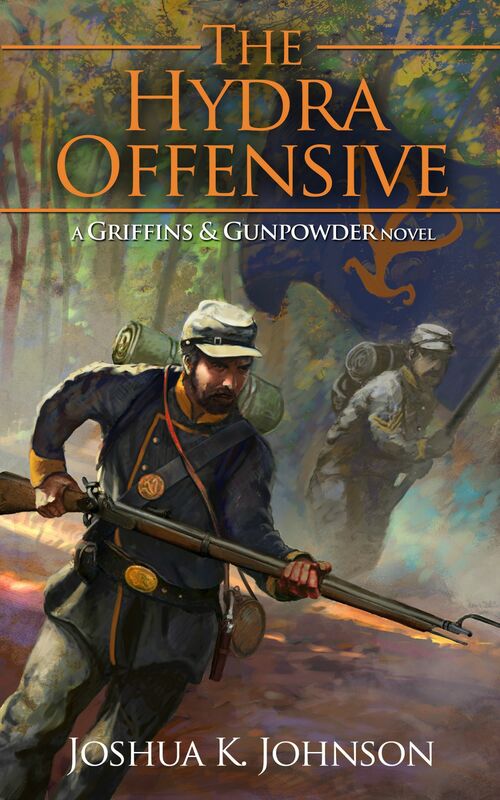 In other news, Gunpowder Fantasy has over 9,000 Views! Thanks everyone for your views and I look forward to the next milestone! The Hydra Offensive is nearly ready for prime time, so in the mean time I’ve put The Cerberus Rebellion on Sale for $0.99! If you haven’t already, head on over to your favorite e-book retailer and pick up your copy! Something that I’ve learned as I plot and write the stories of The Ansgari Rebellion, is that stories are more a living creation than a static work. While the core of the series has remained essentially the same, many of the details have morphed and changed. Characters have walked into the story from out of nowhere and insinuated themselves as cornerstones of the books in which they reside and those that follow. Plot points have moved, from the beginning of the series, to the middle, and now to the end. Even though I am a meticulous plotter, typically drawing up a book’s outline by chapter well before I start writing it, I’ve learned the benefits of being flexible with my story. My style has developed into a sort of hybrid: still heavily plotter, but with just enough pantser to allow for more story to develop and grow on its own. In production news, The Centaur Incursion is underway! I’ve got 1,000 words written and more ready to come out as soon as I get a chance to sit down. Also, The Hydra Offensive is more than halfway through the first round of paper edits. I plan on putting it through a second round, in which I’ll break the chapters down by POV rather than by chapter order. I’ll be looking for beta readers soon, so if you’re interested let me know! I’m nearly completion on the first two rounds of editing for The Hydra Offensive (I’ve been doing a first-pass digital edit and following behind with a paper-and-pen round), so that should be going to edits very soon. 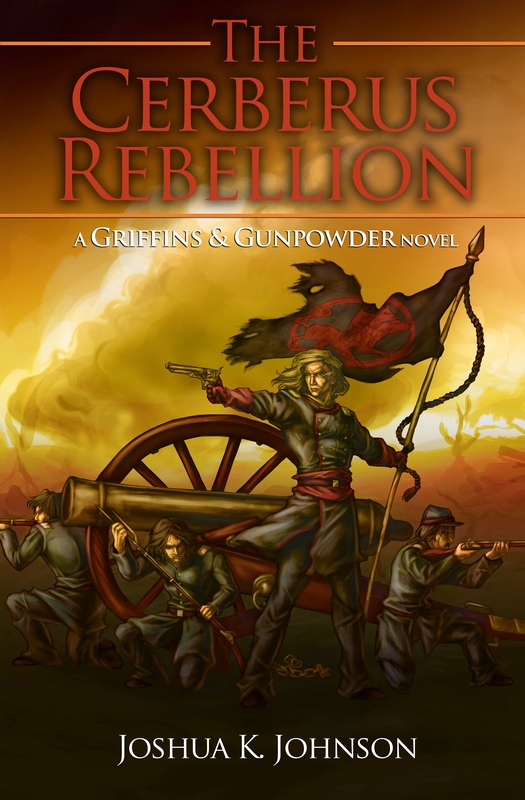 In the meantime, stop by Goodreads and vote for The Cerberus Rebellion to be added to the Gunpowder Fantasy listopia! So some may have noticed a distinct lack of posts in the last couple of months. I just wanted to assure everyone that I didn’t drop off the he face of the earth. Working in both retail and for a major shipping company, November through December is a hectic time of year and I barely had time to sleep much less write. I’m starting classes at Northern Illinois University in a week so going forward isn’t going to be a lot better but I’ve already made progress on editing The Hydra Offensive. Still waiting on a sketch from my cover artist but I’ve got time. So rest assured, The Hydra Offensive is on its way and The Centaur Incursion will be right behind it. Before the Industrial Revolution, populations were dispersed across nations. The number of people that could live in a given area was determined by the amount of food that could be produced close enough to the town/village and brought to market before it spoiled. Whether this was through agriculture, fishing, hunting, or livestock, food production was the number one determining factor of a population. The Industrial Evolution changed that. As I discussed in my post on Agriculture in Gunpowder Fantasy, the reach of farms and farmers, and the ability to mechanize the production process, increased exponentially. This change left many farmhands without work. So they moved to the city, where new textile mills and factories were sprouting up to feed the Industrial machine. Cities began to grow as more and more people poured into them from the countryside. But immigration wasn’t the only factor in the growth of cities. With better medicine and better food, more people were surviving for longer and having more children. Cities suddenly found themselves growing as much as 50% every 10 years. On our world, this increase in population was strictly Human. But in a fantasy world, the immigrants and their children could be of a different species. Imagine a world where industrialization has suddenly rendered the majority of a dwarven city unemployed. Unable to feed their families, these dwarves move to the nearby human city, looking for work in the factories, foundries, and mills. They resent the fact that they have been replaced by machines and left to do the most menial tasks. Imagine the tension between the two species, and any other populations that might live within the city. This tension could lead to the formation of gangs as young, unemployed citizens roam the streets looking for fun, or to exact their own brand of justice on the world. The seeds of revolution could be planted, driving the nation toward civil war. Overcrowding would also become a concern, as more and more people poured into the city, or were born into it. A city that had been built to house 10,000, within a generation it finds itself home to 30,000, many of them poor or uneducated. Sanitation would suffer and disease would spread. The city would tear itself apart as the rich hid within their houses and the pour died in the streets.